"Sneaky Lying Cheating Giant Ninja Koopas"
"Sneaky Lying Cheating Giant Ninja Koopas" is the first episode of The Adventures of Super Mario Bros. 3 and, thus, its series premiere. Inside King Koopa's castle, the Koopalings are rough-housing and fighting amongst themselves. Eventually, the Koopalings are called into attendance for a "Koopa Family Meeting" by Koopa, who says that it's time the Koopalings do something exceptionally dastardly. He goes on to tell a nearby Goomba wearing a headband to to pull a rope to open a curtain to show the life-size portrait of the person they are going to attack. Once the curtain is moved aside, a picture displaying an extremely large Mushroomer is revealed; Big Mouth Koopa identifies the man as Prince Hugo, the new ruler of Giant Land, who is described as being the bravest and strongest prince ever and "giant, even for a giant." A vain Bully Koopa says that the prince is no big deal and elbows Big Mouth to the floor; King Koopa begins to say that Prince Hugo is a big deal, but he'll cut Hugo down to size, by changing him into a miniature poodle with one of his wands, but he'll need a volunteer to get Hugo so he can be transformed. A panicking Bully is suddenly pushed forward by Kootie Pie Koopa. As King Koopa prepares to zap the protesting Bully with his wand, he orders Big Mouth, Cheatsy and Kooky von Koopa to step forward. As Kootie Pie, Hip and Hop Koopa back away, King Koopa zaps Bully, Cheatsy, Kooky and Big Mouth with his wand, turning them gigantic and inexplicably giving them weapons and ninja costumes. King Koopa then commands his colossal children to go out and kidnap Prince Hugo so he can conquer Giant Land. Prince Hugo with Mario, Luigi, Toad, and Princess Toadstool. 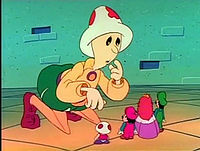 In Giant Land, Mario, Luigi, Toad and Princess Toadstool are attending a meeting with Prince Hugo and the Royal Parrot. Asking Prince Hugo why he called this meeting, Prince Hugo says that his armies have been defeated by the giant-sized Koopalings and that they're now coming for him. Mario reassures Prince Hugo, saying that they'll stop the Koopalings; soon after making this remark, the Royal Parrot begins to criticize Mario and Luigi. Wanting to show-up the uppity Royal Parrot, Mario and Luigi set-off in a Warp Tube to defeat the Koopalings. Outside, Big Mouth, Cheatsy, Bully and Kooky, while rampaging through Giant Land, begin to head for Prince Hugo's castle. Exiting the other end of the Warp Tube, Mario safely falls to the ground and prepares to catch the falling Luigi. Unfortunately, Mario fails to catch Luigi and says the reason for this was that the sun was in his eyes. Insulted, the Angry Sun suddenly charges towards Mario and Luigi in rage; running from the Angry Sun, Mario and Luigi hit a nearby block which releases a Super Leaf. Touching this Super Leaf, Mario and Luigi gain raccoon powers and begin to fly through the air. As Mario and Luigi fly, they are approached by the Angry Sun, who proceeds to ask them if they saw where Mario and Luigi went. Mario and Luigi, bemused by the Angry Sun's obliviousness, say that they went and hid behind a cloud, and the Angry Sun then flies off and begins to search for Mario and Luigi. With the Angry Sun gone, Mario and Luigi head to Prince Hugo's castle. Bully, about to grab Toad and Toadstool. The Koopalings, having reached Prince Hugo's castle, begin to try and break into it. Managing to do so, Bully and Big Mouth proceed to grab Toad and Princess Toadstool, while Kooky and Cheatsy grab Prince Hugo. As the Koopalings prepare to leave, Mario and Luigi appear and begin trying to feebly attack the Koopalings. Big Mouth, annoyed, easily defeats Mario by simply blowing him away. Crashing to the ground, Mario is bitten by a Piranha Plant and loses his Raccoon powers; Luigi also loses his powers after being jabbed by Big Mouth, who grabs the now powerless Luigi. Opening the cage of the Royal Parrot, Big Mouth roughly grabs the bird and tosses it aside so he and Bully can place Toad, Luigi and Princess Toadstool in the cage. 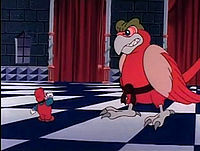 As Bully begins to try and grab him, Mario leaps onto the back of the Royal Parrot and tells it to fly away. At first the parrot is hesitant to leave without its cage, but it finally does fly away when Mario promises to eventually get its cage back. Unconcerned with the fleeing Mario and parrot, Big Mouth says that he and his siblings should just take Prince Hugo, Princess Toadstool, Toad and Luigi to King Koopa and get all their well deserved praise. 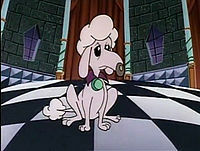 Prince Hugo as a poodle. Having transported Prince Hugo, Toad, Princess Toadstool and Luigi to King Koopa's throne room, the Koopalings, after being told they did a great job by King Koopa, hold Prince Hugo in place while King Koopa uses a wand to transform him into a poodle. After doing this, King Koopa, after grabbing a wand off the wall, prepares to change Bully, Cheatsy, Kooky and Big Mouth back to normal, but is convinced otherwise by Big Mouth, who says with their new size and skills, conquering other kingdoms will be easy. 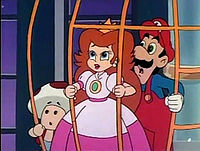 After picking up King Koopa, Big Mouth and his siblings leave while Mario and the Royal Parrot, having somehow entered King Koopa's Castle, approaches the cage containing Luigi, Princess Toadstool and Toad. After briefly whispering something to Princess Toadstool, Mario begins to enact a plan; going over to the rack containing King Koopa's wands, Mario switches the jewels atop the wands, effectively mixing them up; after doing this, Mario goes back into hiding in the shadows. After a few minutes of mocking Prince Hugo, King Koopa is returned to his throne by Big Mouth and begins trying to think of which kingdom he should have taken over. After ignoring suggestion from Cheatsy and Kooky, King Koopa is suddenly approached by Mario, who demands that King Koopa releases Princess Toadstool, Toad and Luigi and that he change Prince Hugo back to normal. King Koopa, believing Mario to simply be bluffing, asks what he'll do if he doesn't give into his demands. Mario tells King Koopa to let his friends and Hugo free and he'll tell him why next Tuesday. King Koopa has Big Mouth grab Mario. Princess Toadstool says from the cage that King Koopa will probably do something horrible to Mario, like turn him into a poodle like Prince Hugo. Thinking that to be a great idea, King Koopa grabs a wand of the wall and zaps Mario with it; thanks to Mario's tampering with the wand though, the wand burns Big Mouth's fingers and causes him to drop Mario; landing on the ground, Mario transforms into a gigantic, ninja version of himself. A bigger and ninjafied Mario. After freeing Princess Toadstool, Toad and Luigi, Mario prepares to fight the Koopalings while his friends rush at King Koopa, causing him to flee and drop his wand; as King Koopa hides behind the giant Kooky, Princess Toadstool, after grabbing King Koopa's wand, transforms the Koopalings back to normal as they rush at Mario. Having regressed back to normal, the panicking Bully, Kooky, Big Mouth and Cheatsy run-away at the sight of Mario. While Luigi changes Prince Hugo back to normal, the Koopalings and King Koopa tremble at the sight of Mario. Prince Hugo's parrot, bigger and ninjafied, about to attack Mario. As Mario begins advancing on King Koopa and the Koopalings, King Koopa decides to abandon his children and hits a nearby block, which causes a Warp Tube to appear out of the floor. Diving into the Warp Tube, King Koopa is quickly followed by the Koopalings; after the Koopalings enter the Warp Tube, it disappears. Prince Hugo, extremely grateful to Mario, thanks him and shakes his hand as Mario is transformed back to normal by Princess Toadstool. Suddenly, the Royal Parrot appears and begins to become extremely upset at the sight of his cage, which was wrecked by Mario when he freed Luigi, Toad and Princess Toadstool from it. 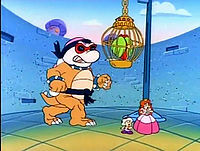 Grabbing King Koopa's wand from Princess Toadstool, the parrot makes itself slightly bigger and gains ninja gear and begins to chase Mario, demanding he fix his cage. When the Koopalings are behind King Koopa, Cheatsy and Kookie's voices lip synced with the other two Koopalings. At the beginning of the episode, when King Koopa is walking near the Goombas, his shell's spikes are white instead of orange. After Mario says that Koopa is not taking over any land, Cheatsy's eyelids are white instead of green. When King Koopa first orders Cheatsy, Big Mouth, Kooky and Bully forward to be transformed into giant ninjas, his crown is missing. When Kooky suggests to King Koopa that they attack Water Land, he noticeably has Bully's voice instead of his own. Throughout the entire episode, the feathers of the Royal Parrot appear to change colors. In a shot showing the Koopalings reaching the Prince Hugo's castle, Cheatsy's head is olive and his hair's yellow. When the Koopalings begin breaking into Prince Hugo's castle, Kooky's head is orange instead of green; additionally, when Bully grabs Princess Toadstool and Toad, his head is completely white. Also, when Luigi, Princess Toadstool and Toad are in King Koopa's cage prison, Luigi's hat and overalls both briefly turn red in color, as well as when Mario lets them out. While Cheatsy is holding on to Prince Hugo, he is not wearing a ninja outfit. When the Koopalings are praising their father and walking around in circles, they all have pink shells. Also, when King Koopa abandons his children both Big Mouth's head and snout are white. The entire time the Koopalings return to normal they all talk when only one should be talking. As soon as they return to normal they're still wearing their ninja outfits for one shot. Sometimes, Kooky's nostrils appear to be missing. When Mario hits the pipe, his raccoon tail and ears are discolored red and white. When Big Mouth suggests which place to conquer next, one of his nails turns the same color as his skin. King Koopa takes the green scepter, but when Big Mouth is suggesting to take over other lands, the scepter King Koopa is holding is red, and when he goes to put it back it turns green again. After Koopa points at the picture of Prince Hugo, the scepter is purple. Also, when King Koopa sees Mario set the others free, his scepter is green, but while he drops it, it turns red. And when Princess Toadstool picks it up and Luigi holds it, it's still red. When Peach approaches Hugo and Mario shaking hands, the scepter's green, but when the view changes, it's red. And when the parrot takes the scepter from Peach, it's blue. When Mario switches the red and green scepters, the scepters switch each others' colors while they're in Mario's hands. At one point, Big Mouth's thumb claw is red, but in the next shot it is normal. When Big Mouth says "I love being a Koopa! ", Cheatsy is seen without his ninja suit. When the Koopas attack Prince Hugo, Bully is holding Princess Toadstool and Toad, but when the Mario Brothers appear, Big Mouth is holding Princess Toadstool and Toad. When King Koopa calls attendance of a "Koopa Family Meeting" Kooky's snout is the same color as his skin. At the very start of the episode, Hip and Hop are jumping on a chair, but when King Koopa calls attendance of a "Koopa Family Meeting", the chair is not shown. After Cheatsy, Kooky, Big Mouth, and Bully get turned giant, Bully's eyes are shown. King Koopa uses a green scepter to turn Kooky, Cheatsy, Bully, and Big Mouth giant, but in the next shot, he has a purple scepter. In one shot of the scene with Prince Hugo, Mario's "M" is white. When the Ninja Koopas are walking through Giant Land, Kooky flashes. When the Ninja Koopas are approaching Prince Hugo's castle, Cheatsy's hair is yellow. When the Angry Sun flies away, he is shown disappearing. When King Koopa hides behind Kooky's leg, the Giant Koopas shrink a little. 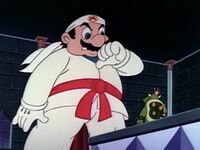 When Bully, Kooky, Cheatsy, and Big Mouth get scared by Giant Ninja Mario, Bully's snout is the same color as his skin. When King Koopa says that he has an appointment in another Warp Zone, Big Mouth's head is black and white. When the Royal Parrot, as a ninja, is trying to get Mario, its feathers are lighter green. The title of this episode is a spoof of Teenage Mutant Ninja Turtles; Big Mouth Koopa even spoofs the Teenage Mutant Ninja Turtles catchphrase ("I love being a turtle!") 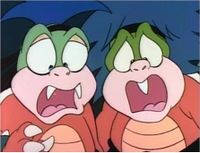 from their first film by saying "I love being a Koopa!" 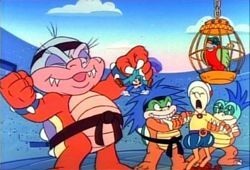 The Koopalings also share similarities to Teenage Mutant Ninja Turtles: they're brothers, they're teenagers, they're based on turtles, they're ninjas, and each of the members' personalities reflect that of a certain turtle. Bully is the team's angry member (similar to Raphael). Kooky is the team's smart member (similar to Donatello). Big Mouth is the team's annoying member (similar to Michelangelo). Cheatsy is the team's neutral member (similar to Leonardo). 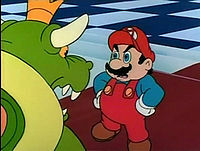 This episode marks the first time in the series where King Koopa is referred to as "Bowser Koopa". In this case, Mario says "You won't be taking over any lands, you Bowser Koopa!" He is also called that in Princess Toadstool for President, Reign Storm, and Crimes R Us. This is the only episode in the series to show parts of it during the credits. ↑ KidsCo TV (December 10, 2017). "Sneaky Lying Cheating Giant Ninja Koopas", dubbed in Romanian by KidsCo. YouTube. Retrieved July 27, 2018. This page was last edited on April 16, 2019, at 07:53.